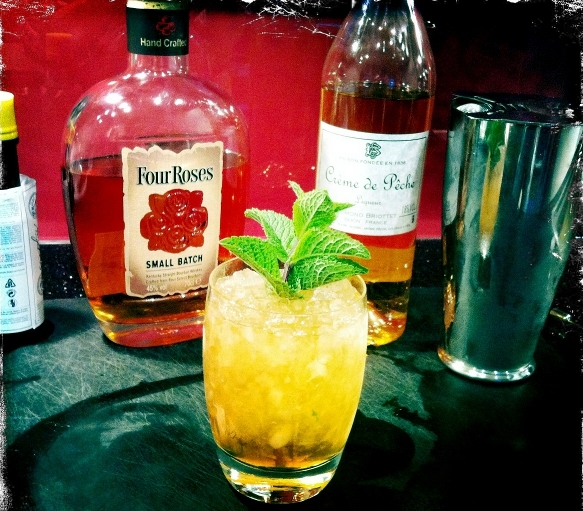 This is a softer, some might say more feminine, take on a Mint Julep. It makes an ideal pre-dinner cocktail, but is also great on a rainy afternoon – the combination of the warmth from the bourbon, and the sweet sunny flavours of the peach act as a reminder of those warm summer days. As Crème de Pêche (Peach Liqueur) is an additional ingredient to the ‘basic drinks cabinet‘ it could also be used to make a great Peach Bellini. Any other uses drop us a message. Lay out all of the ingredients. 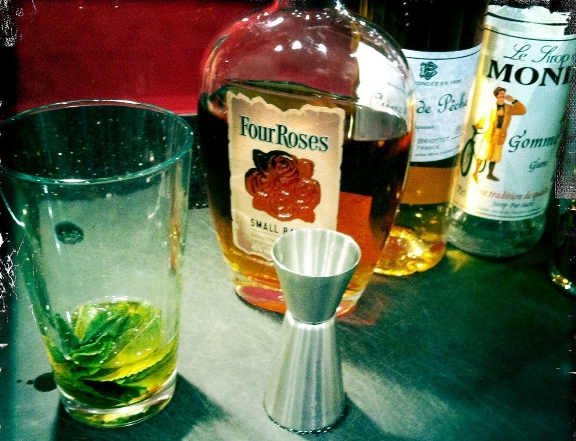 Muddle 12 mint leaves into the Boston glass. Then add the bourbon, crème de pêche and Angostura bitters. 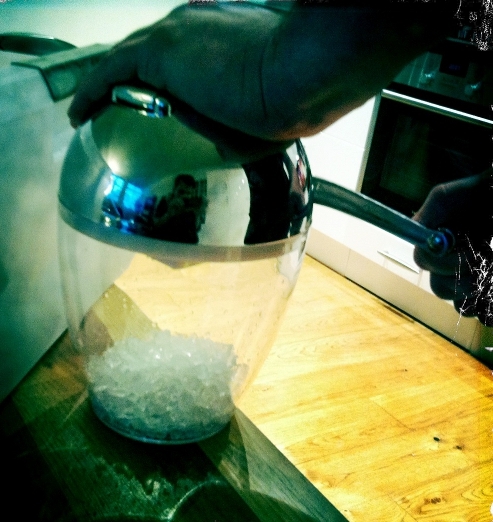 Crush the ice, if you have one use an ice crusher, as pictured. Or wrap the ice up in a tea-towel and bash with a rolling pin – not too hard, we don’t want you to break the kitchen table! 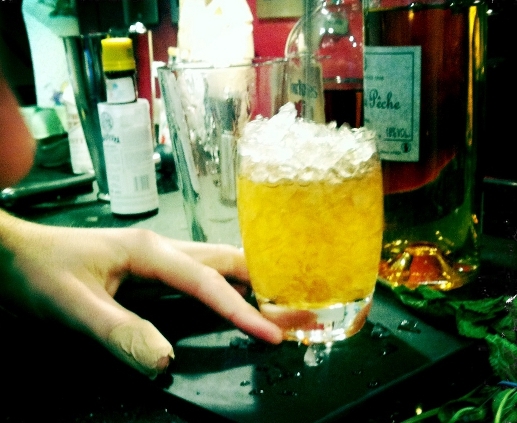 Add crushed ice to the old fashioned glass, make sure the glass is completely topped up with ice. Add non-crushed ice to the shaker, close it and shake. Pour through a strainer into the ice-filled glass. 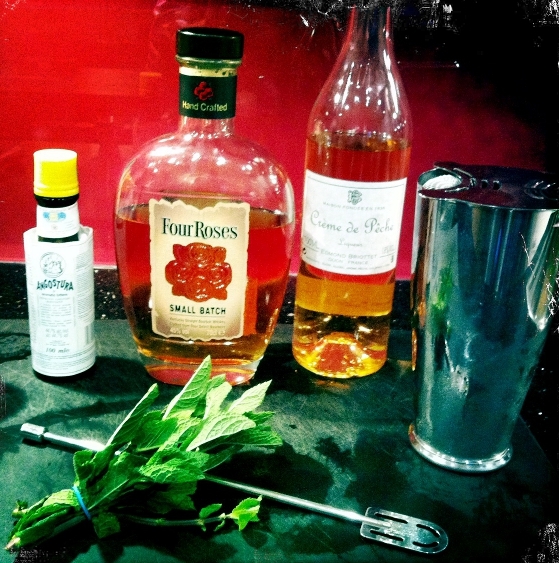 Stir the drink with a bar spoon and garnish with a sprig of mint.